Nestled alongside Old North Wharf. Unit 1 is a beautifully renovated 2 bedroom, 1 bathroom condo in the heart of historic Still Dock. In addition to it’s walk-anywhere location, this bright south-west facing unit boasts a warm and modern open floor plan, lofty ceilings and high end custom finishes throughout. Upgrades include a lovely gourmet kitchen with Subzero refrigerator and high end appliances, wood floors, heated bathroom floor and central air. 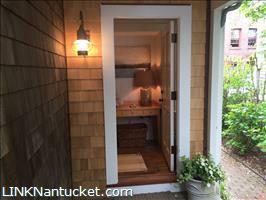 This is a must see for the sophisticated buyer who wants to be in the middle of all Nantucket has to offer!